Find out more about Summer Camps for youth HERE. 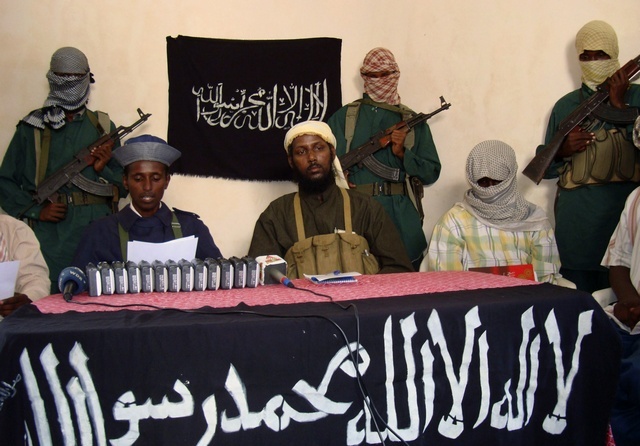 Fierce infighting is reported among rival factions within Somalia’s Al-Shabab militants. The BBC reported six Somali militants and two foreign jihadists were among those killed near the militant stronghold of Brava. The fighting is likely linked to a power struggle between forces loyal to the group’s leader, Ahmed Abdi Godane, and ex-spokesman Muktar Ali Robow. Robow is said to be more moderate and could be pushing to open talks with the government as international attention focuses on rebuilding the country. The country’s parliamentary election of President Hassan Sheikh Mohamud in September of 2012, who’s government was officially recognized by the IMF after 22 years in April, and an international conference in London on the subject of ending the conflict in Somalia, are all likely to be boiling points for the extremists. Earlier this week the al-Qaeda linked organization killed fifteen people in an attack against of the UN offices in Mogadishu. According to Somali news sources, fighting resumed earlier this month around the southern port city of Kismayo, which was liberated from the control of the Islamists in heavy fighting by African Union soldiers and the local Ras Kamboni militia last December. However, fighting there is said to be linked to rival militias, some loyal to the central government in Mogadishu, the others supporting former Somali Defence Minister Ras Kamboni who has declared himself ‘president’ of ‘Jubbaland’. The UN Security Council called on the factions to refrain from armed conflict with each other, and to instead focus on defeating the Al-Shabab militants who fled the region only after fierce fighting. Al-Shabab splintered from the Supreme Council of Islamic Courts in 2006 after that organization lost a series of battles against Somali transitional government forces, backed by Ethiopian troops. Al-Shabab and other Islamist factions are fighting to hold the country side surrounding Mogadishu as Government forces backed by 18,000 African Union soldiers, Ethiopian troops, and pro-government militia struggle to retake their country from the extremists. An EXCITING, unique camp that challenges campers through a variety of activities. This camp is a partnership program with Toronto Catholic School Board, MotionBall Sport and Urban Arts. Activities included leadership training, sport, swimming, arts and field trips. Location: 176- Martine Grove Rd. This dynamic and interactive camp aims to inspire and expose youth to technology. 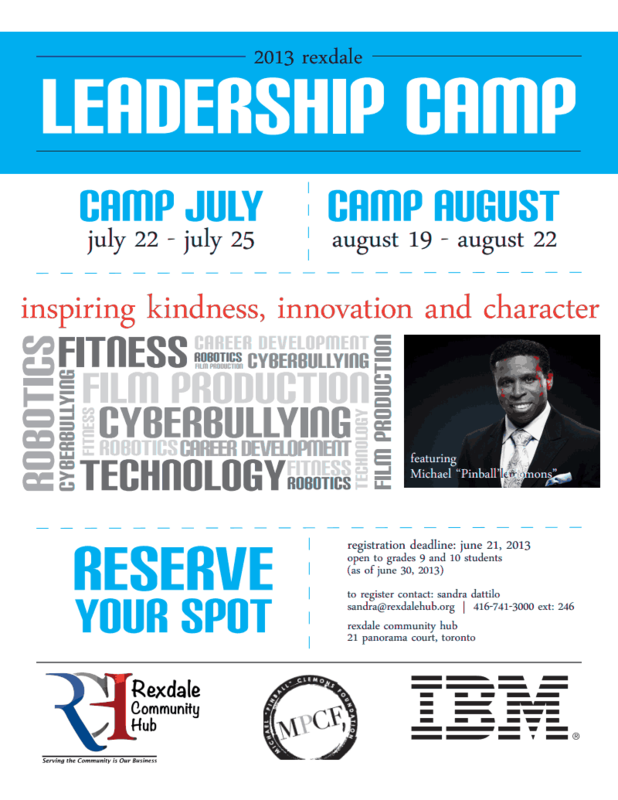 This is a partnership project with IBM and the Rexdale Hub Community Partners. Activities include computer technology, social media, movie making, acrobatics, sports with profession athletes and field trips. The leadership camp provides youth with a basic understanding of leadership in a recreational setting. Join use for an AWESOME summer experience discovering who you are and how to unleash your inner leader. We will explore some cool stuff, play fun games and sport, take on projects, learn about leadership, meet leaders from different walks of life, and enjoy weekly field trips. Dreaming of being your own boss? We will help you explore the possibilities, meet young successful business owners, create a virtual or real business, venture out to see businesses in action, maximize your creative vision. Activities include media arts, games, field trips and traditional camp experiences. This camp encourages young people to develop leadership skills and explore cultural diversity using media arts. Activities include conversations about diversity, weekly field trips, cross cultural food experience and sports activity. The Science and Nature camp gives children the opportunity to learn and enjoy nature. Daily activities include: nature walks, ecology, bird watching, forest exploration, organic vegetable garden, insect observation, swimming and canoeing. Location: 205 Humber College Blvd. Offers youth the opportunity to gain valuable volunteer experience at nature camp and prepares youth for future leadership positions/ Acitivites include, interpersonal skills, communication skills, teamwork skills and gain volunteer hours! After meeting and preparing statements last night, members of the Rexdale Community, largely members of the Somali community affected by the raids conducted by Toronto Police Services and police from across Southern Ontario on Dixion Road last Thursday, held a press conference at the Rexdale Community Hub today to condemn police actions during the raids. “Community members are angered by the destruction of property and disrespectful remarks made by some officers and the police brutality that they were subject to,” said Mahad Yusuf, executive director of Midaynta Community Services. “The community has been further stigmatized by the careless actions of some officers involved in the raid, and the irresponsible conduct of Toronto’s disgraced mayor,” Margaret Parsons said. Parsons also made the allegation that the police choice to target the Dixon community was based on recent media attention connecting Toronto Mayor Rob Ford to residences suspected to be bases in Rexdale’s drug trade, and the now infamous video which allegedly shows Rob Ford smoking from a glass pipe, although the video’s existence has still yet to be proven. Toronto Police Chief Bill Blair had disclosed previously that investigators had herd subjects of their investigations discussing the video several weeks ago over wire-taps that had been in place for nearly a year. Dixon residents in attendance accused police of kicking down doors at random, carrying out unlawful assaults of building residents not subject to arrest warrants, carrying out unlawful arrests without warrants, uttering racial slurs, and needlessly destroying property. 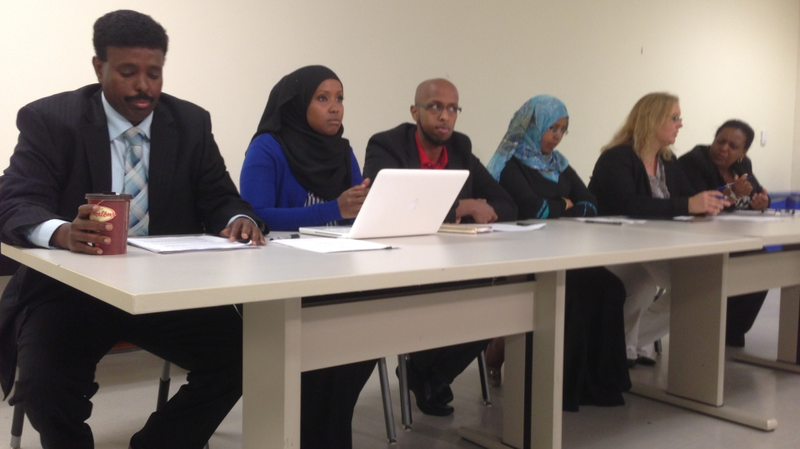 However, not all Somali residents were in agreement with the panel. Margaret Parsons’ call for residents to thank the leaders of the Somali community prompted one woman in attendance to vocalize her distrust of Somali leaders, urging those in attendance to ‘recognize and address the corruption within the Somali community’. This created a huge uproar among those in attendance with many of them calling for the woman to be removed from the public gathering. Mike McCormack, President of the Toronto Police Association, stated in a televised interview following the press conference that the police take all allegations of misconduct seriously, but that many of the residents were ‘victims of their own families’, asserting that drug traffickers intentionally resided with family members to shield them from police investigations. McCormack went on to say that the community at large ‘thinks we did a good job’. Toronto Police Services 23rd Division’s Community Relations Officer, Constable Parm Rai, could not be reached for comment. As a result of Project Traveller 44 arrests were made, 224 charges laid, 40 weapons seized, $500,000 in cash and an estimated $3,000,000 (street value) in narcotics. How much of those arrests and seizures took place on Dixon Road is unclear, with raids being conducted on nearby residences on Mercury Road, and at least eight of those arrested being residents of the City of Windsor. 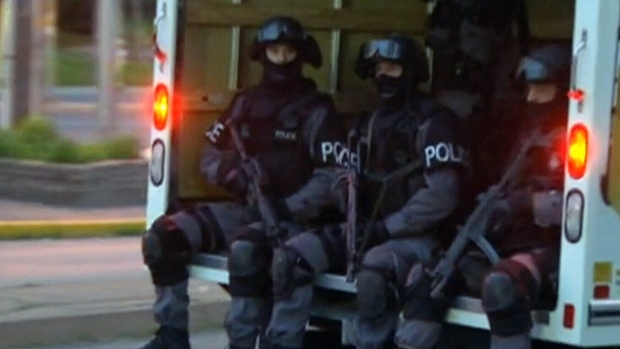 At 3:00 a.m. on June 13, 2013, units located at 320, 330, 340, 380, and 390 Dixon Road were raided by Toronto Police, as part of a police investigation dubbed “Project Traveller”. “In the aftermath of the raids, many community members feel victimized, vilified and traumatized as a result of the reckless manner in which officers forcibly entered their homes. Community members are angered by the destruction of property and disrespectful remarks made by some officers and the police brutality that they were subject to,” says Mahad Yusuf, Executive Director of Midaynta Community Services. While the raids were intended to target criminal elements in the Dixon community, the actions of the TPS labeled and profiled the entire Somali community on Dixon Road as possible criminal elements. “This is particularly hurtful to a community already reeling from systemic barriers to services due to the combined impact of anti-Black racism, and Islamophobia. The community has been further stigmatized by the careless actions of some officers involved in the raid, and the irresponsible conduct of Toronto’s disgraced Mayor,” stated Margaret Parsons, Executive Director of the African Canadian Legal Clinic. Residents shared stories about the raid with community leaders at a Town Hall meeting held at 320 Dixon Road on June 15, 2013. “Instead of providing additional resources, or hiring trauma counselors from within the community to heal the collective wounds caused by the raid, an increased level of policing has been deployed in the community. This only serves to further perpetuate fear in an already victimized and traumatized community,” says Yusuf. At the community meeting several disheartening stories were shared. In one horrifying example, a 100 year old community Elder was so shocked by the raid on her unit she fell to the ground and was not assisted by officers. Her daughter, who is also a senior citizen, was cuffed, pushed to the ground and kicked by officers while her pleas for water to control her high blood pressure were ignored. Another 65 year old woman, who recently immigrated to Canada just 3 months ago, was also cuffed. Children as young as 10 years old woke up to guns pointed at their heads. “All of this has caused near irreparable damage to community police relations and has entrenched the feelings of indignity amongst residents,” says Yusuf. In July 2012 the African Canadian Community responded to the Danzig Street and Eaton Centre shooting by calling for sustainable funding to the African Canadian community for social development programs. “Rather than heeding the call made by community leaders and organizations, the response has been further criminalization and racial profiling of our community. Clearly, nothing has changed,” said Parsons. Canada has one of the largest Somali populations in the western world, with the census reporting 37,785 people claiming Somali descent, though unofficial estimates place the figure as high as 150,000. Somalis tend to be concentrated in the southern part of the province of Ontario, especially the Ottawa and Toronto areas. The Albertan cities of Calgary and Edmonton have also seen a significant increase in their respective Somali communities over the past five years. In addition, the neighborhood of Rexdale in Toronto has one of the largest Somali populations in the country. In the early 1990s, Canada saw an increase in the total number of Somali immigrants entering the country, with some secondary migration from the United States. As with many other immigrant groups in the Toronto area, Somalis have faced some barriers to employment despite counting many qualified professionals; This has been attributed to enclave economies, self-employment, language unfamiliarity, and various public policies and social programs. • The Toronto District School Board Grade 9 cohort study looking at Fall 2000 students found that the highest dropout rates (according to student 9 language) were Portuguese, Spanish and Somali speaking students. • This puts the homicide rate in the Edmonton Somali community higher than the national homicide rates in high-risk countries like Panama, Brazil and the Dominican Republic. • 10 year wait list for affordable housing. Affordability: families spend 50% or more of income on rent. • TCH property aging and in deplorable condition, while the landscape outside is poorly maintained and offers no space to socialize. • Long-term implication of the initial settlement experience. • English proficiency a deterrent. • Lack of affordable child care Foreign skills hard to get accredited. • Over 80% of the Somali-Canadian community is under 30. • Negative perception oft he community. • Institutionalized discrimination based on name or address. • Unemployment rate hovers at 70 % in Toronto alone. • No networks/human capital to tap in. Ontario’s housing crisis is getting worse according to the Ontario Non-Profit Housing Association’s recent report entitled, “Where’s Home”. The report concludes that the Provincial and Federal governments have effectively removed themselves from the business of providing affordable housing, leaving inadequately funded municipal governments and the market, which is fundamentally antithetical to providing non-for-profit housing, to provide affordable housing. The lack of affordable housing will deeply impact growth in the province, since the fastest growing sectors of the market remain low paying service industry jobs. Furthermore, if affordable rentals and homes are not available, Ontarians will be forced to take loans and enter into mortgages that they cannot afford, which could result in a US style mortgage crisis, an idea subtly echoed by Nobel prize winning economist Paul Krugman on his blog yesterday. Long before Facebook and Twitter, online communities were based around Bulletin Board Services and Internet Relay Chats. It was in one such virtual community, The Well, that in 1987 Daniel Ben-Horin was inspired to create The CompuMentor Project. His idea was that technology gurus, or ‘mentors’, would volunteer on technologically intensive projects and initiatives to assist nonprofit organizations adapt to emerging information technologies. In 2008, The CompuMentor Project changed its name to TechSoup Global, and today the organization is the largest not-for-profit provider of technology support in the world. TechSoup Global operates in Africa, the Americas, Asia Pacific, Europe and the Middle East with help from independent capacity-building NGOs. Users can read articles and other educational material, reference and contribute to TechSoup’s knowledge base, participate in training sessions and webinars, discussions, share policies and best practices, and collaborate online and in-person. TechSoup is the exclusive North American distributor of Microsoft product donations, and offers hundreds of software and hardware donations from over sixty partners, including Adobe, Sun, Symantic, Cicso, Citrix, and SAP. Both individuals and organizations can sign-up for TechSoup via their websites, and registering your nonprofit organization is relatively painless, requiring the user submit their organization’s mission, annual budget, and patented letters of incorporation. The website states the approval process takes 5-7 business days, however, our organization was approved the very next day, and eligible for nearly all software product donations. Their customer service team is very quick to respond to comments and questions via e-mail. If you are in the nonprofit world and your organization is paying retail prices for Microsoft and other products out of your operating budget you are losing money by not accepting donations through TechSoup. Although many of us are subject to larger umbrella organizations for technology support or purchasing, TechSoup can still provide valuable knowledge and insight into many emerging and long standing technological topics. Filed under: information technology, IT crowd, not-for-profit, social change | Tagged: adobe, best practices, bis, cisco, citrix, compumentor, daniel ben-horin, development, discussion, donation, information systems, information technology, it, mentoring, microsoft, nonprofit, sap, sun symantic, technical articles, technology, techsoup, techsoup canada, techsoup global, training, volunteer, webinar |	Comments Off on What’s a TechSoup Kitchen? GTA police agencies, including officers from Peel, York, Halton, Barrie, Guelph, Windsor, the OPP, RCMP, Toronto Police Services 23 Division, 31 Division, Toronto Anti-Violence Intervention Strategy (TAVIS), and Emergency Task Force (ETF) kicked in doors early this morning in a series of raids that netted 40 firearms, $3 million in drugs, and lead to 43 arrests in Toronto and Windsor, where police agencies there also conducted raids. 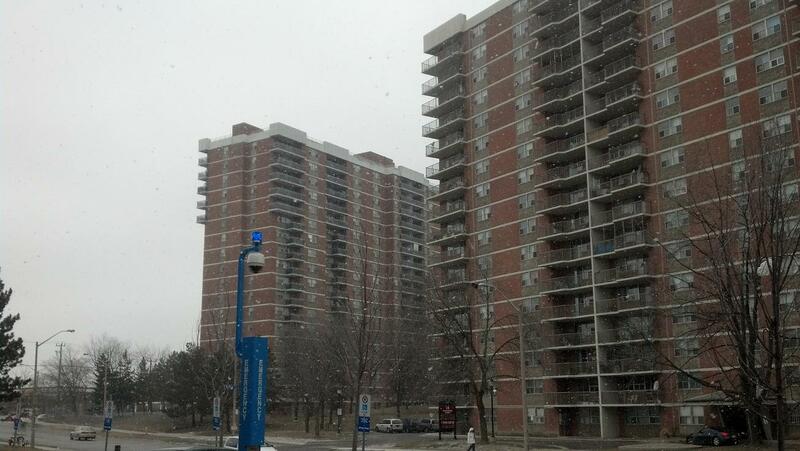 The raids primarily targeted a cluster of apartment high-rises on Dixon and Mercury Roads. Toronto Police Chief Bill Blair also made the disclosure that Toronto Police investigators were aware of the video which allegedly shows Mayor Rob Ford smoking crack cocaine weeks before the media got word of it. Police gained knowledge of the video from wipe-taps. When questioned, Blair also said many of those arrested were of Somali origin, but that everyone would be treated ‘fair and equally’. The operation was code named ‘Project Traveller’, a joint operation between police agencies, Canada Border Services Agency, and likely the RCMP’s Immigration Task Force which operates out of the Greater Toronto Enforcement Centre at 6900 Airport Road.